Inkjet printers all utilise one of the following ink types. 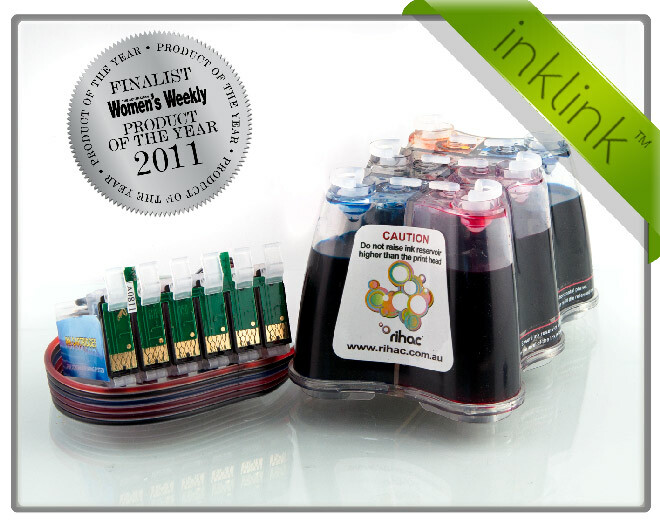 Dye Inks: Dye inks are water based where the dye is dissolved in a water base. Dye inks produce stunningly vivid prints but at the expense of increased fade rates. The reason behind the vividness lies in the way in which light is reflected to the eyes. Dye inks are absorbed into the paper and lay flat. Light bounces directly back to the eye producing a visually vivid image. At a microscopic level there is a great deal of space between the molecules and UV light (together with ozone gases) breaks down the connecting bonds which results in fading. + Strikingly vivid prints, bigger colour range (gamut), price. - Fade rates, colour shifts. Standard Pigment inks have a very good fade life (in the order of 20 times dye inks) but tend to look a little duller than dye inks. Pigment inks essentially form bubbles on the paper surface and this causes light to reflect in various directions and not directly to the eye. This results in prints looking a little dull when compared to dye ink prints. Pigment ink does not absorb into the paper like dye inks and thus produces a sharper image and text with considerably less bleed however is easily scratched. + The print life is outstanding, virtually no bleed. - More costly, easily scratched, tend to look dull compared to dye prints. Photo Pro inks are a resin encapsulated pigment ink utilizing Cabots CAB-O-JET patented pigment dispersions. Resin encapsulation is process where the pigment crystal is coated in a resin polymer. This technology prevents coagulation and settlement issues as it prevents agglomeration, the attraction of electrically charged particles. It also prevents the crystals from catching and bonding which is an issue with traditional pigment inks. The resin coat allows them to roll of each other creating a smooth flowing ink with even particle distribution. A greater colour gamut (increased colour range) is achieved as the pigment particles are not clumped and thus are more evenly distributed when in suspension. Because of this rihac Photo Pro inks are suitable for printing on resin coated glossy media which can produce prints of near equal vividness of dye inks. The resin also acts as a bonding agent for the papers allowing the inks to adhere to the surface making the prints far more scratch resistant than other inks. Light fastness is increased due to two primary factors. 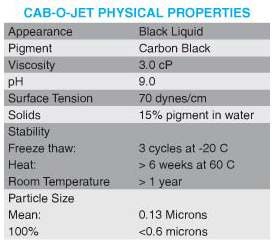 Firstly the Cabots CAB-O-JET dispersions already have an outstanding fade rating as per the DIN 54004 scale but also the resin protects the pigment particles minimizing UV light damage. Resin encapsulation is process where the pigment crystal is coated in a resin polymer. This technology prevents coagulation and settlement issues as it prevents agglomeration, the attraction of electrically charged particles. The even distribution of particles results in a higher colour gamut and higher gloss giving a smooth image appearance. 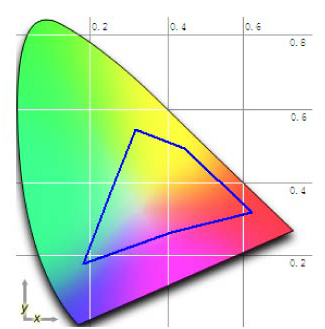 Conventional pigment inks often have a uneven distribution resulting in a lower color gamut. Conventional pigment inks lay on top of media and scratch easily. Photopro pigments are fixed on media by the polymerizing resin making them more durable and scratch-resistant. Particle swelling due to heat or age is a significant issue with aftermarket inks. This issue is typical of those inks imported from Asia and introduced to the market via places like Ebay. The ink viscosity and particle size must allow the ink to exit the print head. Marketing of pigment inks do not mention particle swelling which results in constantly blocked print heads and can cause irreparable damage to printers over time. When developing our inks we focused on ensuring particle sizing increases were minimized over the life of the ink. 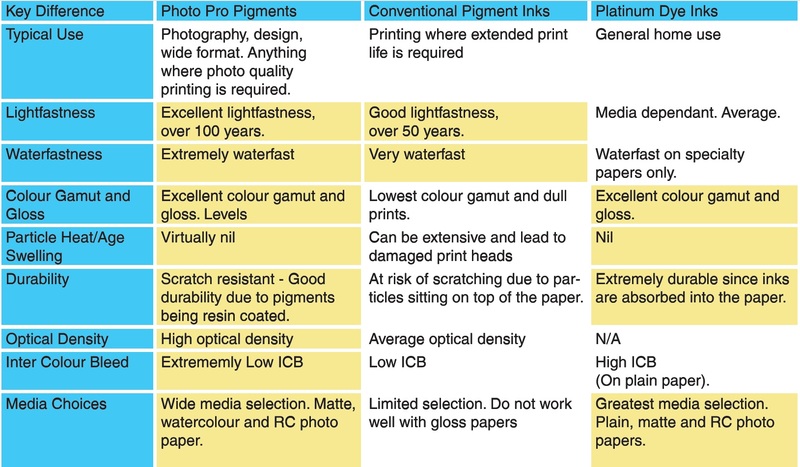 The chart below demonstrates how rihac Photo Pro Pigments combine lightfastness, stability and waterfastness advantages of conventional pigment inks with the colour gamut, durability and wide media selection advantage of dye inks. Cabots proprietary surface modification technology allows for the attachment of functional groups to the surface of the pigment particle. This attachment technique results in the highly reliable and stable dispersions. As the stabilizing groups are attached to the surface of the pigment particle, there are no polymers or surfactants in the bulk of the dispersion that can adversely effect properties such as viscosity and surface tension or contribute to foaming and kogation. This technology also allows for tight control of the pigment surface chemistry, which results in consistent, high on paperï¿½ perforce. Properties such as optical density, edge acuity, intercolour bleed, dry time, mottle etc are controlled by the chemistry of the pigment and the ink formulation in which it is incorporated. - If you do not use your printer every week, perform a power cleaning cycle. - For extended periods of non use (two weeks or more), remove the cartridges and gently shake them prior to use and then perform a power cleaning cycle.